History has shown midterm results can be unkind to the president's party when the president's job approval rating is under 45%. 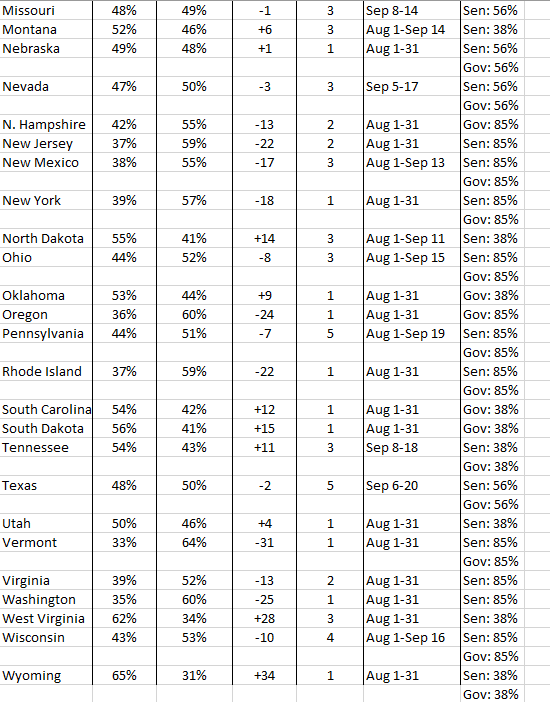 Given that midterm elections have long been thought of as referendums on the president’s party, it seems like a worthwhile venture to take a look at Donald Trump’s job approval rating in the states holding senate and gubernatorial contests this November. By examining the results of past contests, and comparing them to state-level presidential job approval, patterns emerge that offer insight into what to expect after the dust settles on November 6. For the purposes of this article, exit polling from the last four midterm elections was used to determine the president’s job approval rating in any given state (2014, 2010, 2006, 1998). 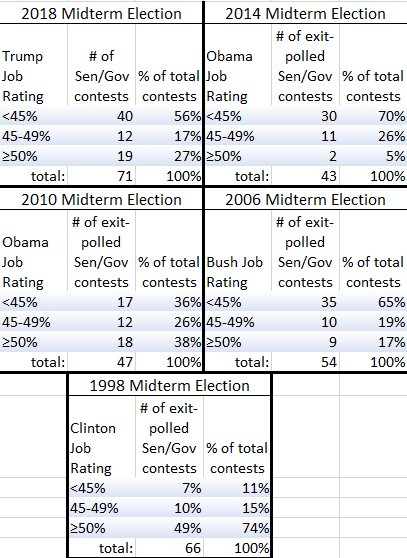 Because of issues with the data at the time it was taken, exit polling from the 2002 midterm election is excluded. When the president’s job approval rating is under 45% in a particular state, there’s a strong chance (85%) that the non-presidential party will either flip that seat to their side, or at least hold the seat for their party. When the president’s job approval rating is between 45-49% in a particular state, the odds of the non-presidential party flipping or holding the seat are about even (56% of the time). 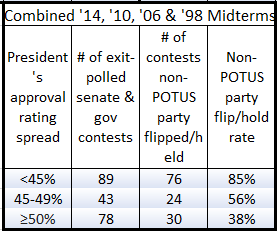 To see how I arrived at these conclusions, consider the tables below, which document the number of senate and gubernatorial contests that fell into one of these three ranges of presidential job approval in the last four midterm elections. 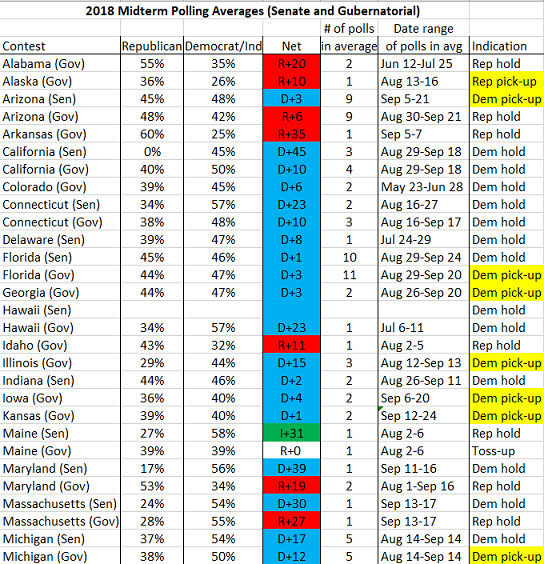 The fifth table combines the data from the previous four midterm cycles into one, making for larger sample sizes. The overall trend holds across a total of 210 exit-polled senate and gubernatorial contests. 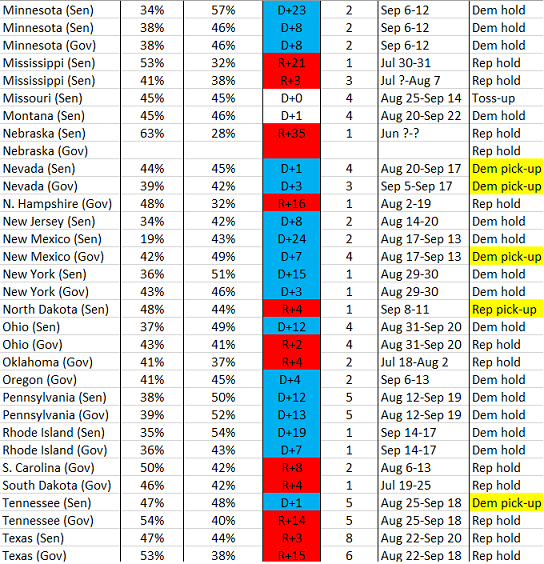 As you can see, over the last four midterm cycles, there were 89 exit-polled senate and gubernatorial contests in which the president's approval rating was under 45%, and the party out of presidential power won 76 of them. There were 43 exit-polled contests in which the president's approval rating fell between 45-49%, and the party out of presidential power won 24 of them. There were 78 exit-polled contests in which the president's approval rating was at 50% or higher, and the opposing party only won 30 of them. What are the implications for Republican prospects in senate and gubernatorial contests this November, given the opposing party's performance within a range of presidential job approval over the past four midterm cycles? That depends on Donald Trump’s state level job approval rating. 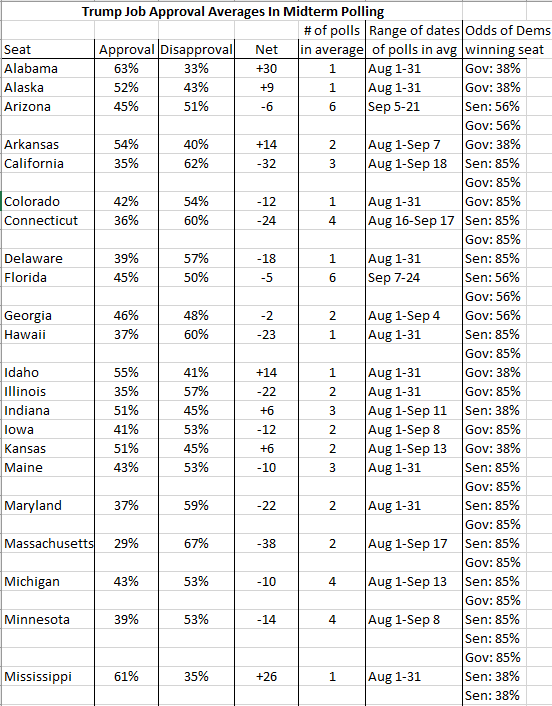 The table below documents just that - the president's average approval rating in every state holding a senate or gubernatorial contest this November. Please ask if you would like access to the data used in compiling Donald Trump's state-level job approval ratings. There's some obvious bad news here for President Trump. His approval rating is currently under 45% in more than half (56%) of the senate and gubernatorial contests to be held in November. Why is that bad for the president? Because the party out of presidential power wins senate and/or gubernatorial midterm contests 85% of the time when the president’s approval rating is under 45%. The good news for President Trump? It could be worse. Take the 2014 midterm election, for example. Barack Obama's job approval rating was under 45% in 70% of the exit-polled senate and gubernatorial contests. Republicans ended up gaining 9 senate seats and 2 governor's mansions. Likewise, George W. Bush saw his approval rating under 45% in 65% of exit-polled senate and gubernatorial contests in 2006, earning Democrats 6 senate seats and 6 governorships. 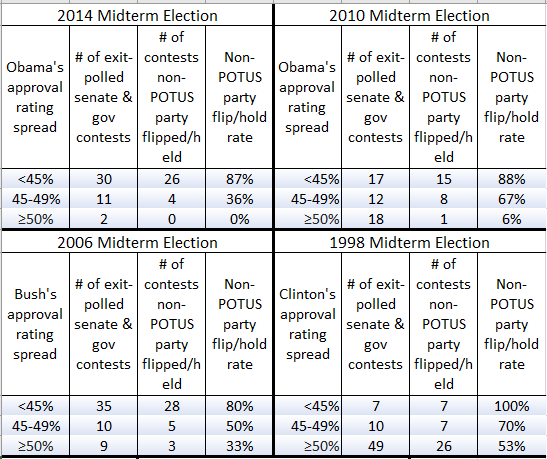 The table below illustrates presidential job approval in exit-polled senate and gubernatorial contests from the 2014, 2010, 2006, and 1998 midterms, and compares that to President Trump's job approval rating in states holding contests this November. As you can see, Barack Obama in 2014 and George W. Bush in 2006 were very unpopular in the majority of exit-polled contests. Bill Clinton in 1998 was quite the opposite. President Trump's job approval rating, as of today, falls in between them. 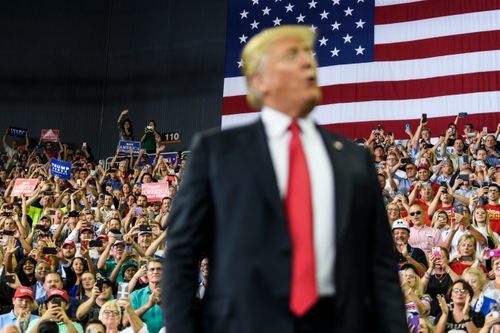 Based on what we know from past midterm exit polling, what does Trump’s state-level job approval ratings tell us about what to expect on election night? In a nutshell, it confirms what we already knew. If presidential approval polling was our only metric to go by in predicting the results of upcoming senate and gubernatorial contests, it suggests that Democrats will pick-up a whole bunch of governorships, and will lose three senate seats (making the composition of the Senate 54 Republicans, 46 Democrats/Independents). This is roughly in line with most forecasts, as well as current state polling averages of senate and gubernatorial contests. Ask if you would like access to the data used to compile state averages. Data mostly comes from public sites such as Real Clear Politics, Wikipedia, and Dave Leip's US Election Atlas. As you can see from the table above, current senate polling averages suggest that if the election were held today, Republicans would end up with 49 senate seats, Democrats would end up with 50 seats, and 1 seat would be a toss-up. The polling suggests that Democrats would flip Arizona, Nevada, and Tennessee. Republicans would flip North Dakota. Missouri would flip from blue to toss-up. Regarding gubernatorial contests, the table above suggests that the Republican's 33 seat majority would drop to just 24 governorships if the election were held today. The number of Democrats in governor's mansions would increase from 16 to 25. There would be one toss-up. Current polling suggests Democrats would flip 9 state governorships - Nevada, New Mexico, Kansas, Iowa, Wisconsin, Illinois, Michigan, Georgia, and Florida. The Republicans would pick-up one seat in Alaska. Maine is presently a toss-up given the only poll we've had of the race. The bottom line is that with President Trump currently under the critical 45% approval mark in over half of the contests taking place this November, Republicans have a lot of exposure. While the current composition of the Senate doesn't look as though it will change all that much, even a minor shift could give Democrats control of the chamber. And the partisan composition of state governor's mansions is likely to look very different on Wednesday, November 7. The Trump Admin has two things on their side - time, and the fact that they are not currently in as bad of shape, from a job approval perspective, as Barack Obama and George W. Bush were at this point in 2014 and 2006, respectively. But time can be a double-edged sword. Things could get better for Republicans, or worse.